The eGovernment team at SSC embraced Web2.0, sensing the importance of the move from one-way portals and delivery of information to increased interaction, two way communication and collaboration. 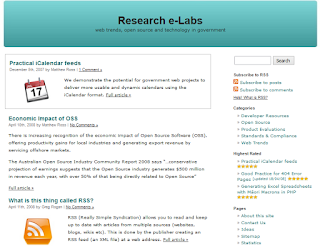 In 2007, the team launched an eParticipation wiki and and an eGovernment research discussion forum. 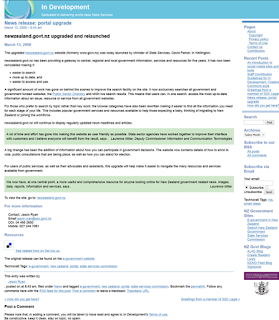 In early 2008, the unit started blogging and adopted Yammer as a social media tool. As Joanna McLeod wrote in the first blog post: "Other agencies ask us for guidance in setting up their own blogs – what better way to help them than to give a clear demonstration of how we do it, and the policies behind our thinking? We’re interested in issues around identity, privacy, accessibility, intellectual property, web standards and Web 2.0. Views expressed in this blog are those of the contributors, and are not necessarily the views of the State Service Commission or its official policy." 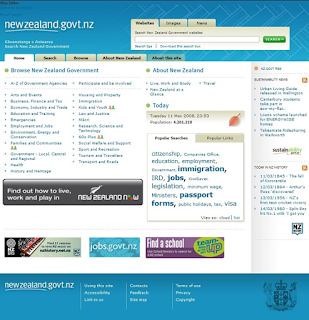 The Portal was upgraded to respond to the changes in technology and public expectations and a new portal was launched in March 2008, by the Minister of State Services David Parker. At the launch, he spoke about the need for government to keep up with the pace of change in the web world; over three years, ideas that were just emergent, such as the use of images and RSS, had gone mainstream. 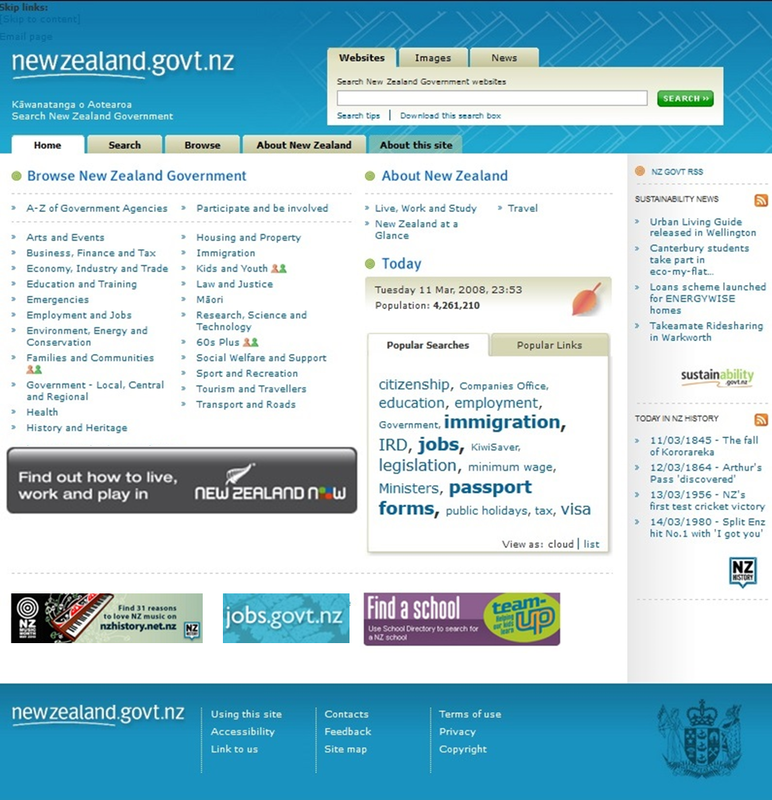 The portal created a joined up and consistent experience across government (no wrong door) with a new Look and Feel, Tag clouds that reflect usage, and search in te Reo, as well as the opportunity to provide context specific promotion of agency services. 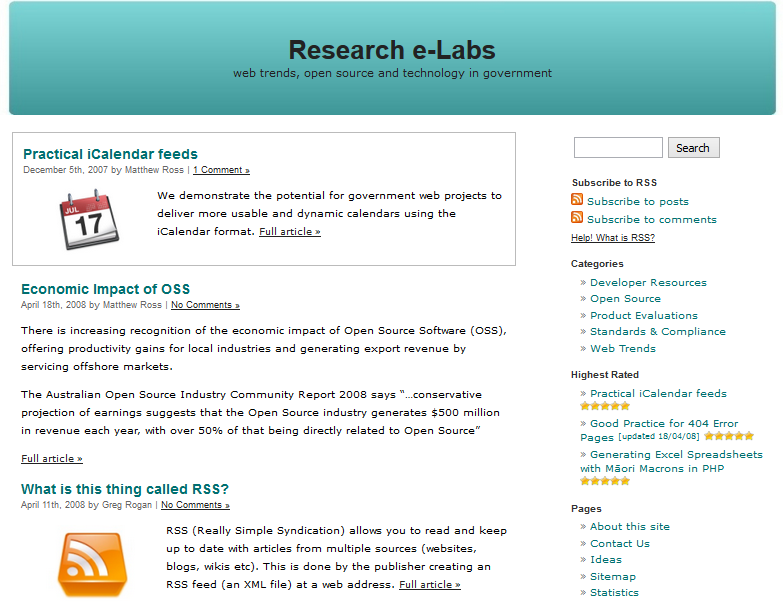 The portal remained stable in this format for the next six years. 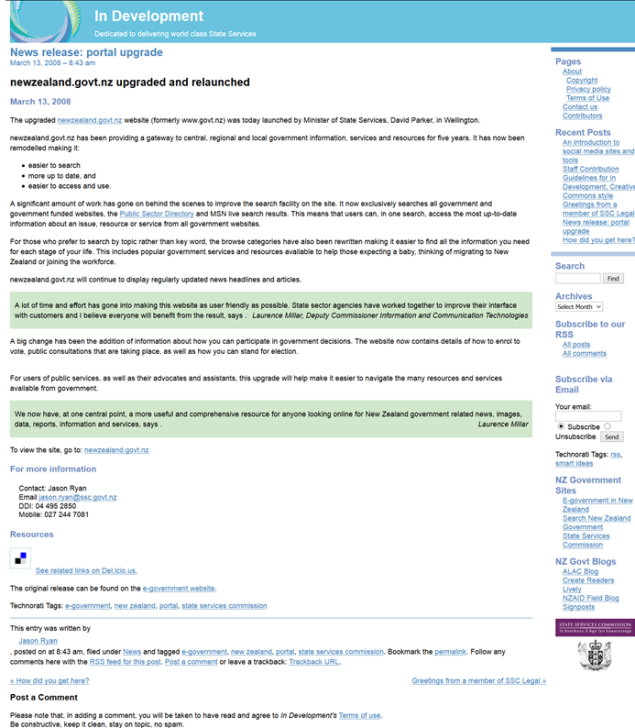 By 2008, the EGU had grown from a dedicated policy focus, to operate all-of-government 24x7 services like the Government Shared Network (now one.gov) and authentication (now RealMe). While it had benefited considerably from being close to the centre of government, the branch was now a dominant part of SSC with more than half the staff and 80% of the capital expenditure. Cabinet decided that strategy and policy leadership should remain at SSC under the newly designated 'New Zealand Government CIO', and that service delivery (Government Technology Services) should move back to the Department of Internal Affairs. The transition was executed in two stages: in 2008 the separate functions of GCIO and GTS were established in SSC, in preparation for the transfer to DIA a year later. 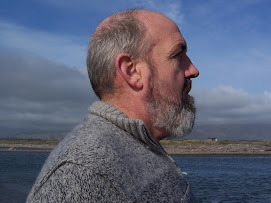 In November 2008, Laurence Millar addressed the Public Sector Chief Executives as GCIO, and spoke of how the world had changed in the years since a group of them had suggested that e-government needed whole of government leadership. Government had collectively created policy and standards, built a portal, a secure network, authentication, LandOnline, TeAra, Companies Office, online tax returns, Customs single window, Studylink, National Digital Heritage Archive, and many more online services in every agency and sector. He closed his speech by suggesting that these achievements were not enough and that the government had not kept pace with the technologies that had so dramatically changed the expectations of New Zealanders. Following the transfer of GTS in 2009, eGovernment strategy and policy leadership remained in SSC for 18 months, and then was also moved to DIA. Brendan Boyle, by now Secretary for Internal Affairs, took on the role of Government CIO. He commented: “The prime minister is quite clear on the need for a CIO; he sees the advantages of a modern ICT environment and is a great believer in what ICT can do in terms of productivity. There is a greater tendency now to be more collaborative. 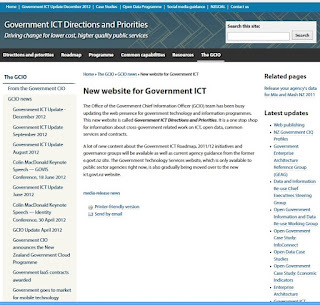 I want to get the government ICT environment to be as coordinated and efficient as if we were one organisation.” The new website highlighted the directions and priorities for government ICT. 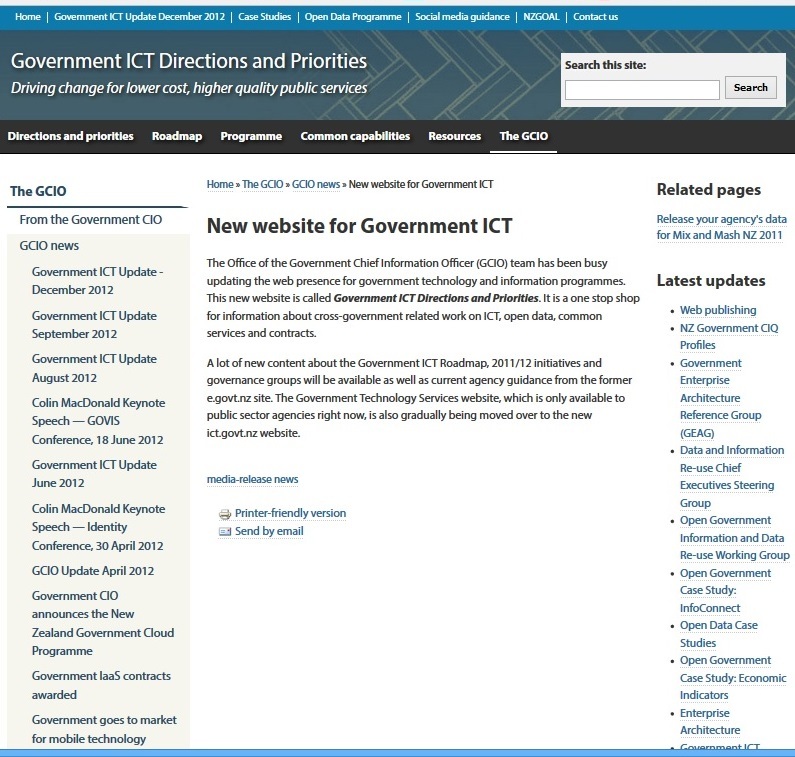 The Knowledge, Information, Research & Technology branch was formed to encompass the strategy and policy role from SSC, Government Technology Services, Archives NZ, and the National Library, headed by Stephen Crombie, previously head of GTS.